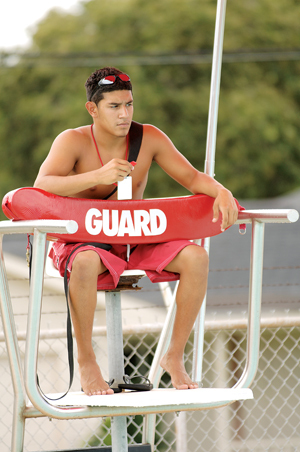 American Red Cross Lifeguard programs are designed to prepare individuals to become certified lifeguards in the pool and waterfront aquatic environments. The program is a combination of various aquatic and non-aquatic safety components. Each class will consist of classroom and pool time. For the water portion of the program, participants need to bring a bathing suit, goggles, swim cap and towel. For the classroom portion, participants need the class book (passed out on first day), a pen and notebook. The primary purpose of the American Red Cross Lifeguarding course is to provide entry-level lifeguard participants with the knowledge and skills to prevent, recognize and respond to aquatic emergencies and to provide professional-level care for breathing and cardiac emergencies, injuries and sudden illnesses until emergency medical services (EMS) personnel take over. The purpose of the Waterfront Skills module is to teach lifeguards the skills and knowledge needed to prevent and respond to emergencies in non-surf, open water areas found at public parks, resorts, summer camps and camp playgrounds. *Candidates must have a current American Red Cross Lifeguarding/First Aid/CPR/AED Certificate to participate in the Waterfront module. The purpose of a Lifeguarding Review Course is to give individuals the opportunity to review the course content within a formal course setting in order to renew their certification. The review course format optimizes a participant’s ability to successfully complete the knowledge and skills evaluation testing. *A current Lifeguarding/First Aid/CPR/AED certificate or certification expired by no more than 30 days is required to be eligible to take a review course. * Review course participants should bring a pocket mask to class with them. Swim 300 Yards (Lifeguarding) 550 yards (Waterfront) continuously (NO STOPPING) demonstrating breath-control and rhythmic breathing. Candidates may swim using front crawl, breaststroke or a combination of both but swimming on the back is not allowed. Swim goggles are allowed. Starting in the water, swim 20 yards. The face may be in/out of the water. Surface dive, feet first or head first, to a depth of 7-10 feet to retrieve a 10-pound object. Return to surface and swim 20 yards to return to the starting point with both hands holding the object and keeping the face at or near the surface so they are able to get a breath. Exit the water without holding using the ladder or steps. Additional for (Waterfront): Swim 5 yards, submerge and retrieve three dive rings placed 5 yards apart in 4 to 7 feet of water, resurface and continue to swim another 5 yards to complete the skill sequence. Be 15 years old on or before the final scheduled session. Attend the entire course and participate in all class sessions. Actively participate in all course activities & assignments. Pass the final practical in-water, CPR & FA skills scenarios. Successfully pass final written exams with an 80 percent or above. PLEASE NOTE: Participants should bring a bathing suit, goggles, swim cap, towel, pen, & notebook, snack/lunch/dinner/beverages to each class.